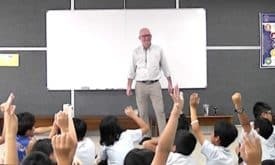 Dave Fox offers lively and engaging writing and intercultural workshops for students and educators – from short, single-session workshops to extended writer-in-residence programs at schools and on school trips. He teaches proven techniques to facilitate a richer understanding of foreign cultures, and demonstrates effective methods students can use to write about their international and intercultural experiences. Currently based in Ho Chi Minh City, Vietnam, Dave is available to teach his workshops worldwide. He will tailor his talks to fit your school’s goals, needs, and budget. If you do not have a budget to bring him to your school, he also offers workshops and consulting via Skype. If you would like to discuss ways Dave can help your school, please e-mail him directly at [email protected] Tell him about your school or organization, and your goals for working with him. He’s happy to schedule a conversation via phone or Skype to discuss various workshop and consulting packages in more detail.